Some working on it in Photoshop CS3 to adjust curves/tones and contrast, following by tweaking in Nik Viveza and Sharpening. Evaluation: Good for a first try. 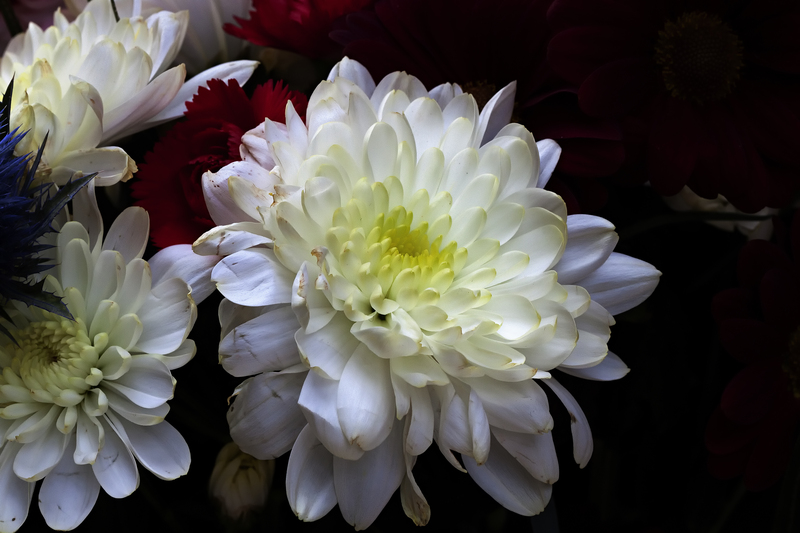 I had noticed that the camera dropped slightly, after adjusting the angle to focus specifically on the inner petals of the largest flower, even though I’d tightened it on the tripod. This might explain why the focussing wasn’t quite crisp enough, even with tweaking. It could have been caused by the added weight of the lens. Additionally, I had dinked the button manually rather than use a cable release. I had shied away from using a tripod up to now. Partly because it seemed to take me ages to set it all up and also because it meant I couldn’t ‘be spontaneous’. However, this time I enjoyed the whole process and found it quite relaxing.